The Spanish branch of communications company Vodafone is to invest over €55 million in the Canary Islands between now and March 2015. 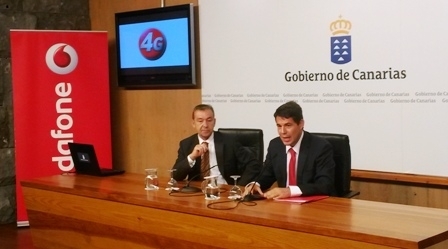 29.07.2014 - During a meeting with the Canarian President, Paulino Rivero, the director of Vodafone Canarias, Pascual Carrascal, explained, “Some of this investment is part of the Spring programme which we announced last Autumn to expand the new generation networks and improve the clients’ experience”. The Spring programme has accelerated the ultra-fast wideband network connection in the Islands so that there is now 4G coverage in all the largest tourist zones and especially along the coast. Currently 54 boroughs in the archipelago are covered and plans currently underway mean that a further eight boroughs will receive Vodafone 4G cover and that the service will be available on all the Islands. Vodafone 4G is now available in Tenerife in Santa Cruz de Tenerife, La Laguna, Arona, Adeje, La Orotava, Grandilla de Abona, Los Realejos, Puerto de la Cruz, Candelaria, Guía de Isora, Güímar, El Rosario, San Miguel de Abona, Santiago del Teide, Garachico, Icod de los Vinos, Tacoronte, Santa Úrsula, El Sauzal and Buenavista del Norte; and in La Palma: Santa Cruz de la Palma, Llanos de Aridane, Breña Alta, Tijarafe and Fuencaliente de la Palma; Gran Canaria: Las Palmas de Gran Canaria, Telde, Arucas, San Bartolomé de Tirajana, Santa Lucía de Tirajana, Agüimes, Galdar, Mogán, Santa María de Guía, San Nicolás de Tolentino, Agaete, Teror, Ingenio, Santa Brígida, Vega de San Mateo, Firgas and Artenara; Fuerteventura: Puerto del Rosario, La Oliva, Pájara, Tuineje and Antigua; and Lanzarote: Arrecife, San Bartolomé, Teguise, Tías, Yaiza, Tinajo and Haría. New boroughs to be added soon are: Arico and Tegueste in Tenerife; San Sebastián de la Gomera and Alajeró in La Gomera; Valverde, Frontera and El Pinar in El Hierro; and Gran Canaria’s Valsequillo. Produced with news.CMS in 0,0870 seconds.